Whether you're ready to take on bigger projects or looking for the right size excavator to fit a job, step up to a 60D. 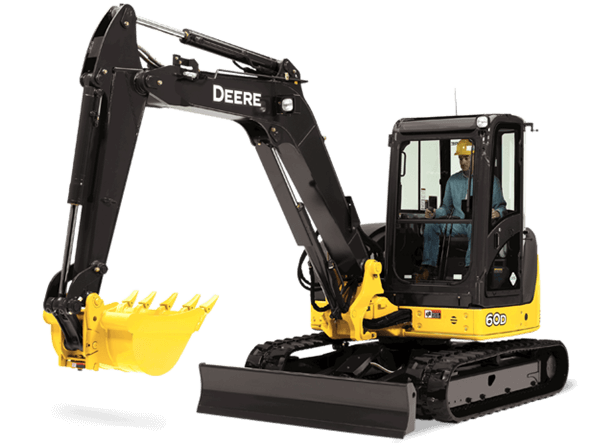 Deere's largest compact excavator, the 60D is just right for landscaping, underground/utility, or site-development work. Like our other compacts, it excels in close quarters and is easy to trailer. But with its powerful dig forces, impressive digging depth, and spacious, comfortable cab, this highly capable compact produces and feels more like a small midsize excavator. And with a rugged interim Tier 4 engine and excellent serviceability, you'll get more done with low downtime and operating cost. Add it all up, and you've got a compact excavator that will make a huge impact on your bottom line.